KELLER — Members from 15 parishes in the Diocese of Fort Worth reflected on several facets of stewardship during the fourth annual Diocesan Stewardship Day of Renewal held March 30 at St. Elizabeth Ann Seton Parish in Keller. Bishop Michael Olson and Archdiocese of Indianapolis pastoral staff member Ken Ogorek led the discussions, which examined stewardship from both the personal and community levels. Bishop Olson, while celebrating the Mass that opened the day's activities, contrasted the approach to God as taken by a Pharisee and a tax collector in Luke 18:9-14. The Pharisee boasts and holds himself above others while the tax collector offers a simple prayer of humility as he seeks mercy for his sinfulness. Those we admire we tend to do so from a distance, Bishop Olson said. Ogorek's first talk, “Growing Closer to God,” touched upon the personal aspects of stewardship and discipleship and discerning one's place in the quilt of community. 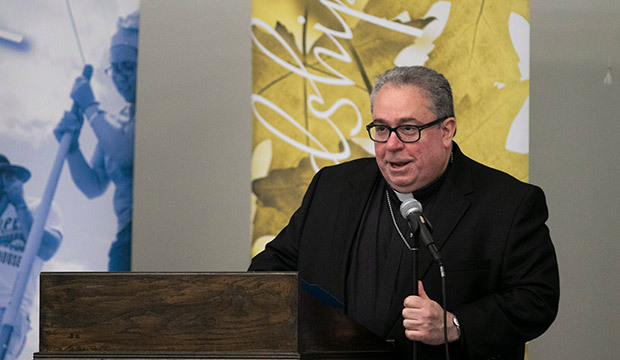 Help in discerning matters of stewardship and other spiritual questions is available through the Holy Spirit, Ogorek said. Ogorek spoke of the role charisms play in elevating stewardship to the community level. Ogorek cited Patrick Lencioni's book, The Ideal Team Player. 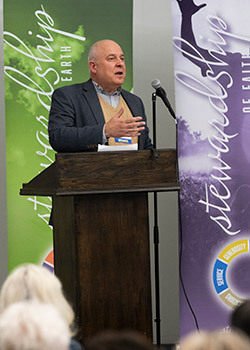 Although the book addresses business issues, Ogorek said the values of being humble, hungry, and people-smart applies to stewardship and strengthening one's relationship to God as well. Ogorek concluded by stressing that teamwork is key to successful stewardship. St. Michael Parish of Bedford Stewardship Committee Chairman Tracy Gomes said he's attended all four renewal days. St. Elizabeth Ann Seton parishioner Roberta Walker, who is involved in several ministries, gave the day high marks. 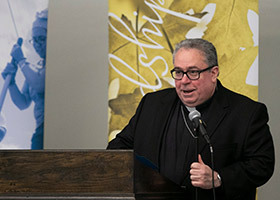 The series, Bishop Olson said, has enriched the diocese. 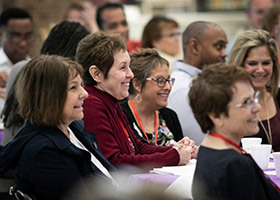 KELLER — Members from 15 parishes in the Diocese of Fort Worth reflected on several facets of stewardship during the fourth annual Diocesan Stewardship Day of Renewal held March 30 at St. Elizabeth Ann Seton Parish in Keller.